This is what we currently have available and available to pre-order now. Please fill in your contact details and make your selections by using the drop down boxes below. If you don't have an Email address, please provide a postal address. Also please add your postal address if you want clothing items below posted to you! PLEASE DO NOT USE COMMAS! STOP PRESS: CUT off dates for items 1 and 2 are as follows. B. Orders up to 5th July should be available for pickup on 19th or 21st. C. Orders after 5th July. Please include postage as above for delivery after the celebrations. Or if you are lucky enough to live in Canberra for pickup by arrangement later in July or August. The other items can be picked up on the 19th or 21st July. Can you please hold off ordering between 15th and 22nd July to give our long suffering Treasurer a chance to catch up!!!! 1. Feeling the chill of the Canberra Winter? 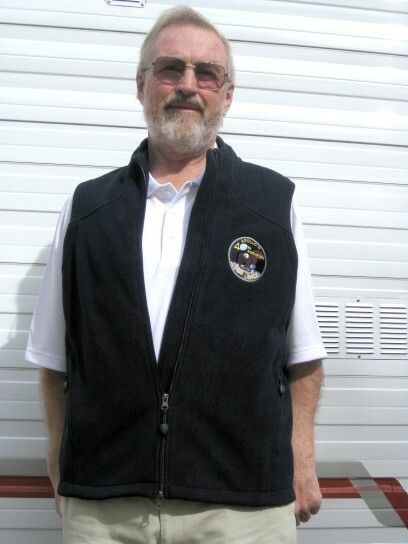 Try this Fleecy sleeveless zip up Vest with embroidered 40th Logo. Meet our model Phil at the events. . The vest come in 8 sizes: S, M, L, XL, 2XL, 3XL, 4XL and 5XL (suitable for both Men and Women). The embroidered logo looks like the one on the shirt below. Please allow 4 weeks for delivery or pickup after payment. Also if you order after 21st June 2009 you will need to add postage charges. If you are lucky enough to live in Canberra, you could probably pick-up locally by arrangement. 2. 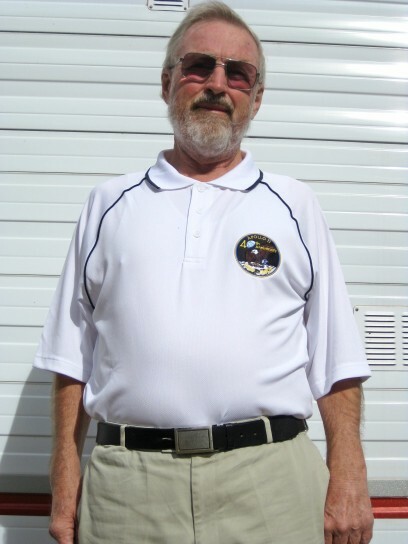 These handsome Polo Shirts come in a staggering array of colours and sizes for both Men and Women. In sizes: S, M, L, XL, 2XL, 3XL, 4XL and 5XL (Suitable for both Men and Women). Please use the allowable colour combinations above! 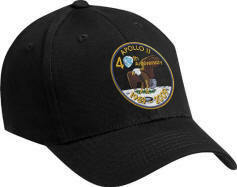 We have purchased 100 of these fantastic caps with our 40th Apollo 11 Logo for sale to you at the amazing price of $10. Using this form you can purchase as many as you wish in any colour you like so long as it is BLACK. However, if there is spare stock by 19 July you can buy them for cash at the events on July 19 and 21. We will only sell on-line until stock runs out. In the event we do sell out, then you can place orders on July 19 and 21 provided you are willing to collect locally by arrangement. If you require postage then an additional cost will be incurred. 4. 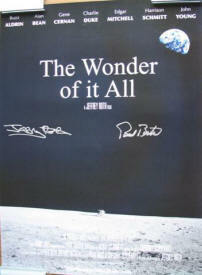 We have also obtained 20 posters for 'The wonder of it all' one of the films we will see on Wed 22nd July. 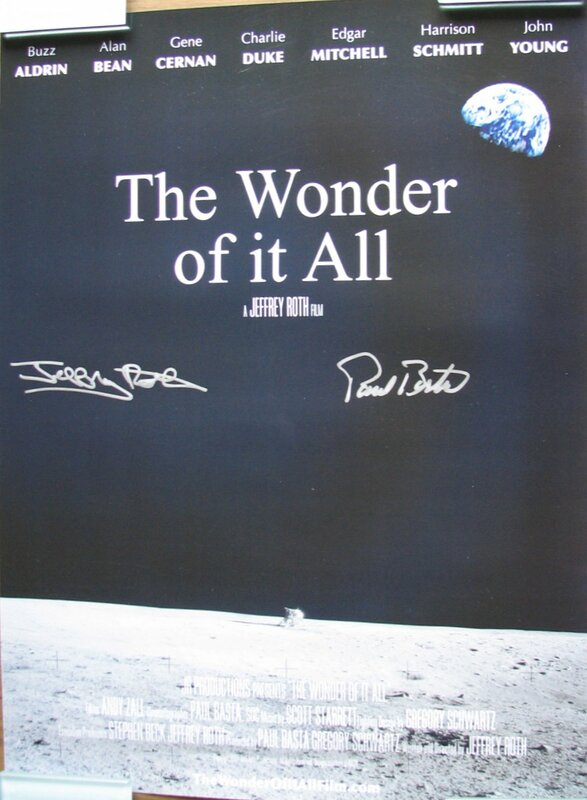 See www.jsaxon.org/space/hsk/Reunions/40th2009/22Jul.htm These posters are individually signed by Jeff Roth (Producer) and Paul Basta (Producer & Cinematographer). They can be pre-ordered here for $10 or buy for cash (if there are any left :-) Once stock runs out - the offer can't be repeated. Just tell us how many you would like. Sorry about the less than perfect picture. Click to enlarge. 5. 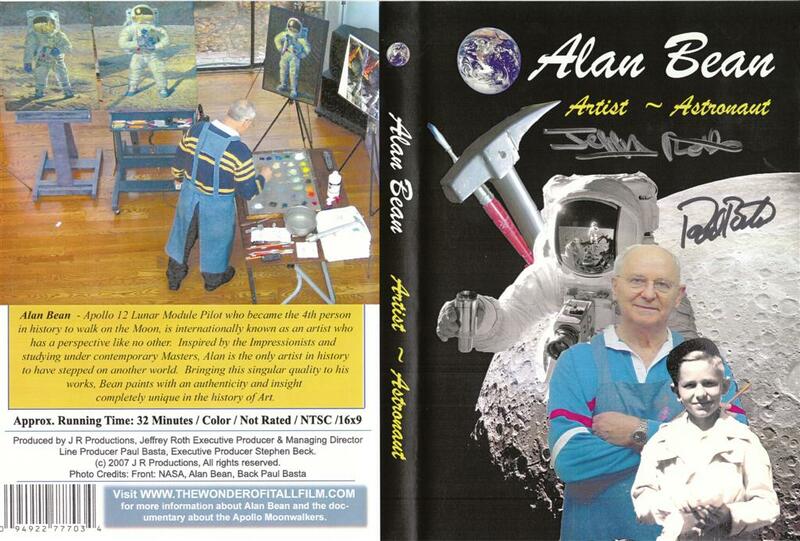 The producers of 'The Wonder of it all' followed up their interview with Alan Bean (the 4th man to Walk on the moon) and made a special DVD. Again the producers have kindly individually signed each DVD. Alan is an Artist and this is a great little DVD where he explains his inspiration and techniques. We have obtained 20 of these DVDs and you can pre-order here for $10 or buy for cash. Again we caqnnot repeat this offer once stock runs out. Click to enlarge. Any comments or requests you would like to add? If you complete and send this form - we will Email or Post you an Invoice with payment instructions, you do not need to pay money until we send you an invoice! Note: If you Pre-order clothing (except for hats) now, you will probably have to pick up after the 22nd July if you live in Canberra. Or provide a postal address per items 1 & 2 above.